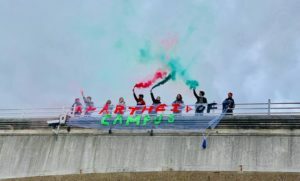 Home / Blog / Latest news / LIVE BLOG: #ApartheidOffCampus national student day of action! 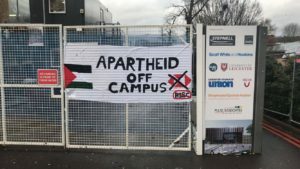 LIVE BLOG: #ApartheidOffCampus national student day of action! 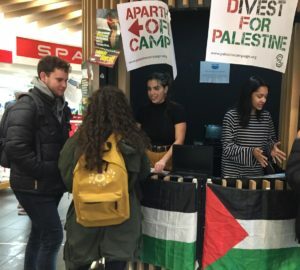 Today, on the UN International Day of Solidarity with the Palestinian People, students at over 30 UK universities are taking action to protest their institution’s complicity in Israeli apartheid. 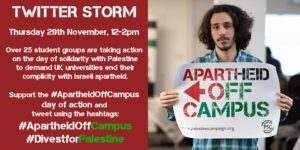 Follow this live blog as the day’s action unfolds and show your support for the campaign on Twitter by using the hashtags #ApartheidOffCampus and #DivestForPalestine! 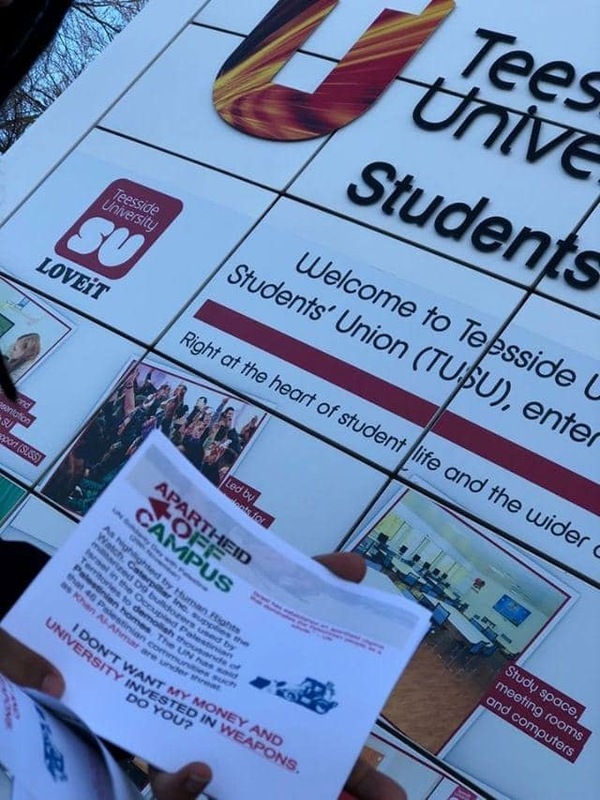 Teesside students call on their university to end their complicity with Israeli apartheid. 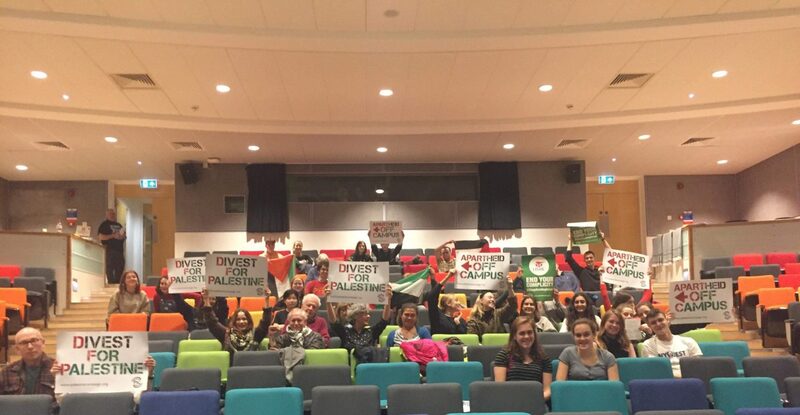 Students at Nottingham University held a demonstration calling for their University to #DivestForPalestine and get #ApartheidOffCampus. 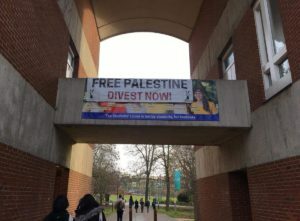 King’s College London students did this amazing banner drop off Waterloo bridge! 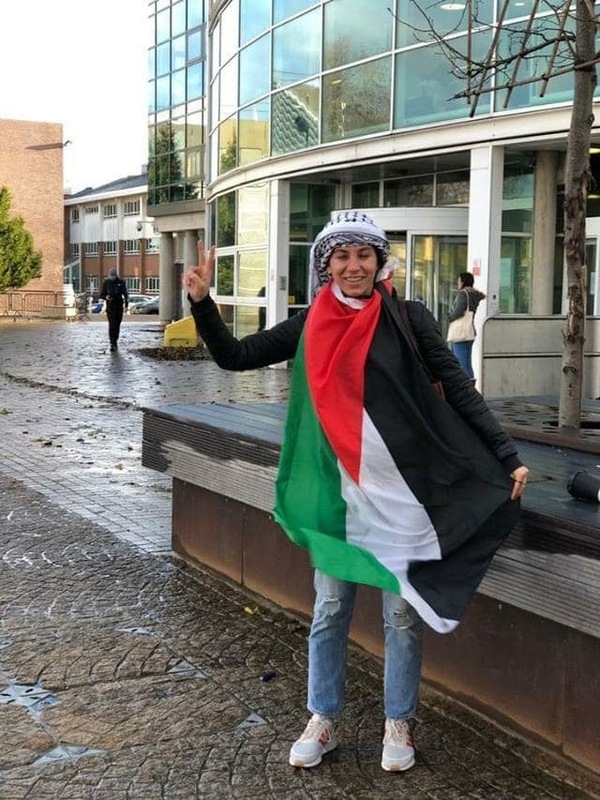 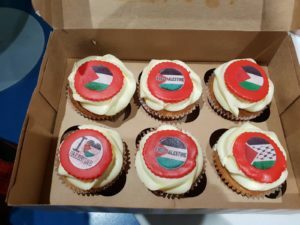 Continuing with their day of action, students at Sheffield Hallam are selling Palestine cupcakes and giving free dabke lessons – teaching students the Palestinian dance of resistance! 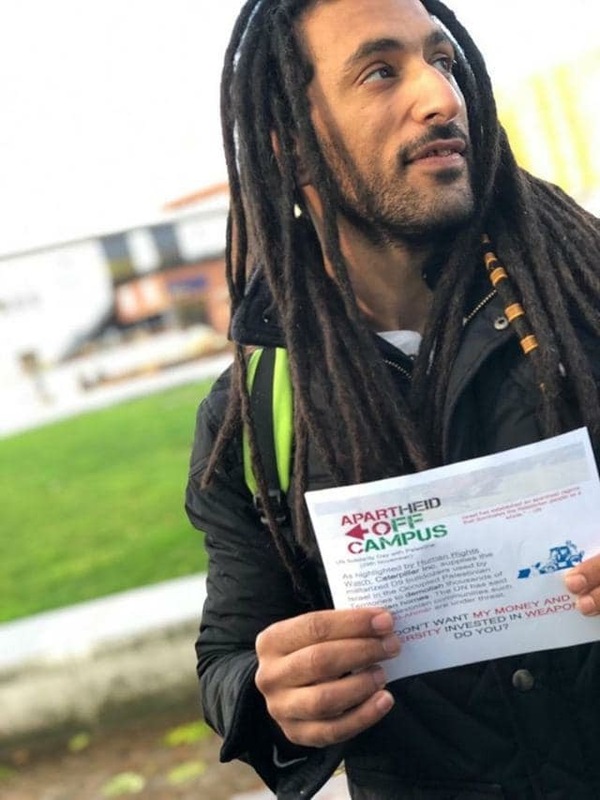 Reading University students mobilised on their campus, handing out loads of #ApartheidOffCampus leaflets and gaining support for their upcoming campaign. 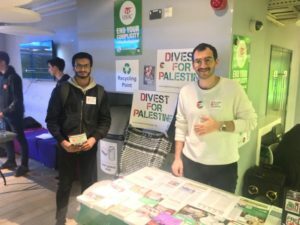 Students at St. George’s are holding a stall to launch their new campaign which calls on the university to adhere to the principles of BDS. 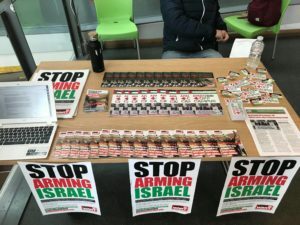 Keele students are doing a stall on campus to raise awareness of their upcoming #ApartheidOffCampus campaign, gathering lots of interest from students! 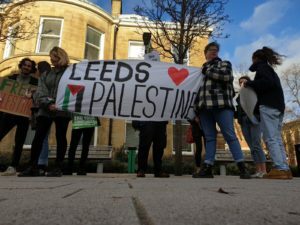 Amazing vibrant demonstration at Leeds University, calling on the institution to fully divest from HSBC following the recent announcement that they had cut financial ties with 3 corporations linked to the Israeli arms trade. 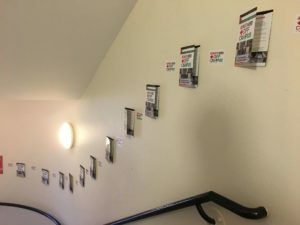 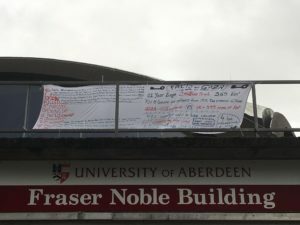 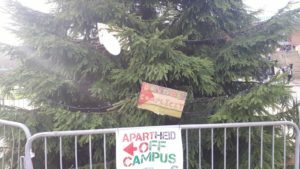 At Aberdeen University, students activists have done a banner drop and plastered the campus with #ApartheidOffCampus flyers! 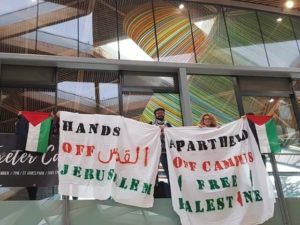 Students at Exeter University have staged a banner drop and demonstration calling for #ApartheidOffCampus! 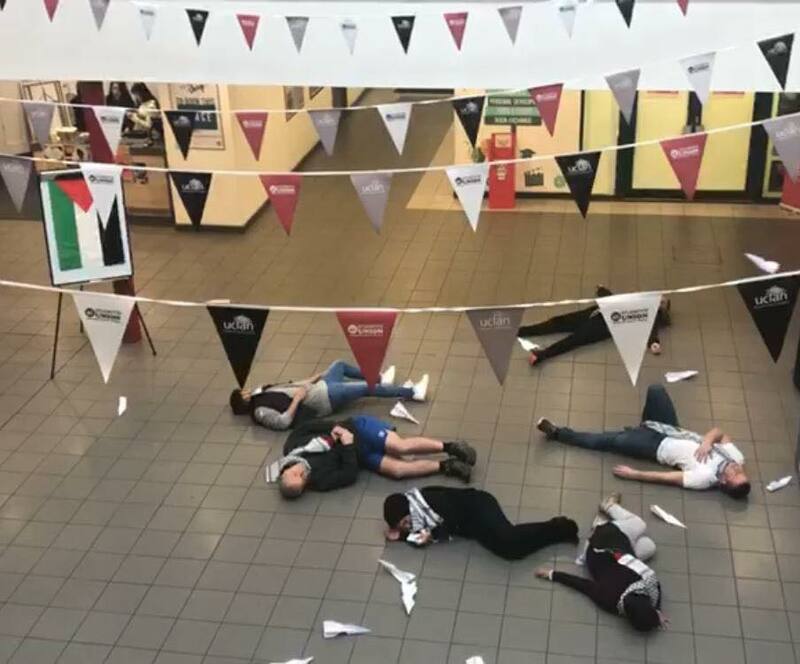 Sussex students are continuing their day of action with a banner drop on central campus! 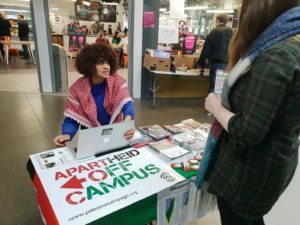 Students at Sheffield Hallam University are holding a stall on campus before their #ApartheidOffCampus event commences…watch this space! 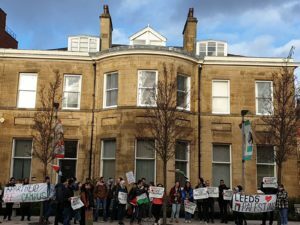 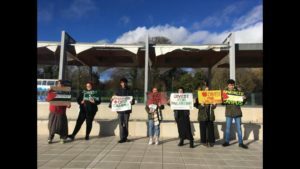 Lancaster student activists have staged a demonstration calling for #ApartheidOffCampus! 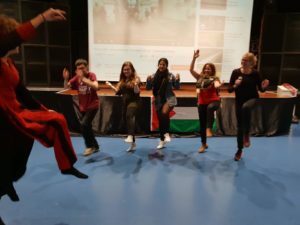 Students at Cardiff University have put together this incredible exhibition of photos taken by children living in the Palestinian village of Bil’in! 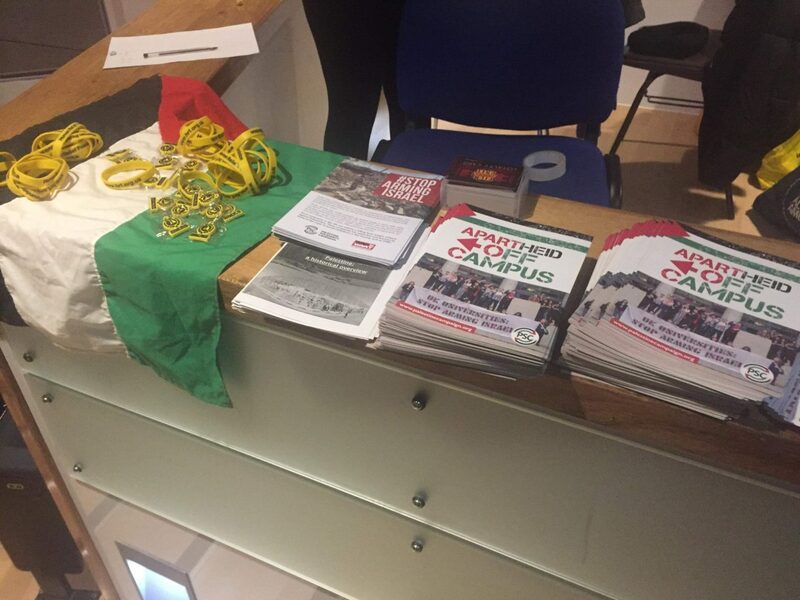 Wolverhampton students are holding a stall in their SU to speak to other students about the #ApartheidOffCampus campaign. 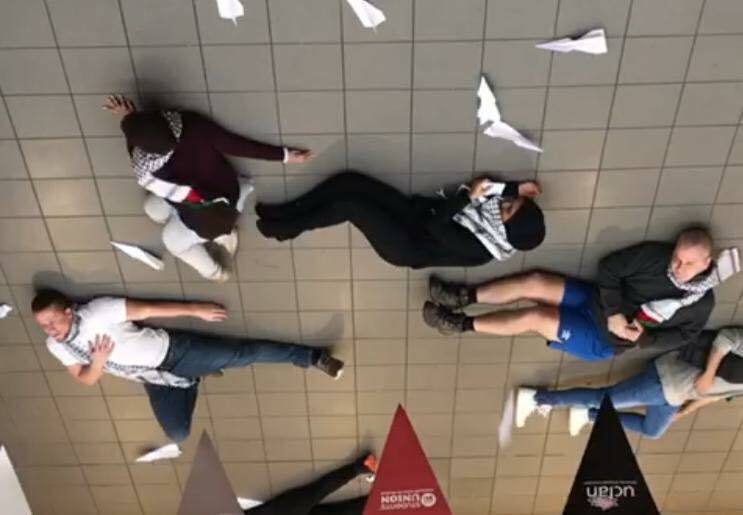 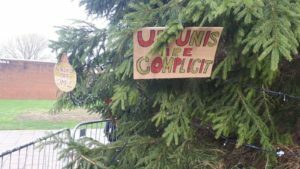 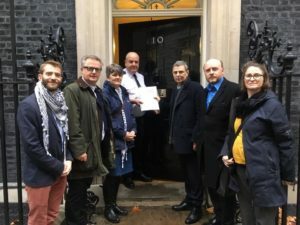 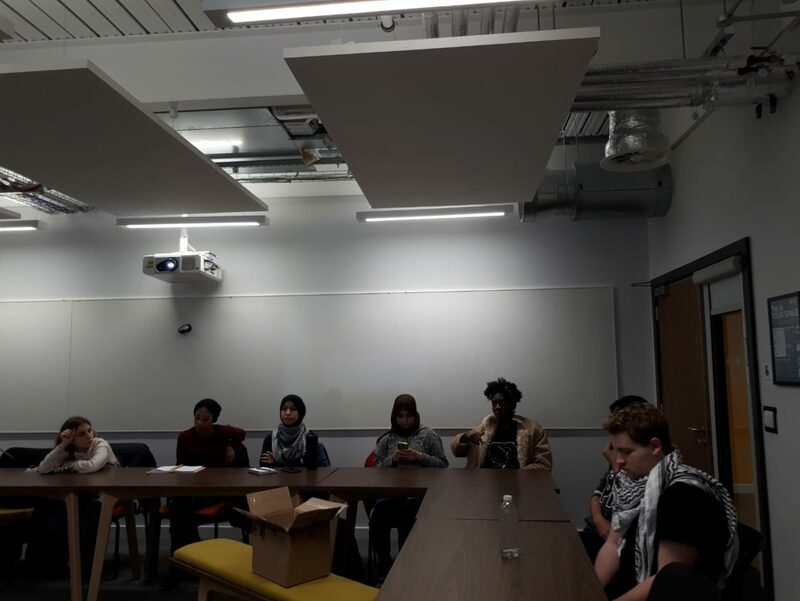 Students at the University of Birmingham have just launched their campaign calling for their university to divest from United Technologies who supply aircraft for the Israeli military. 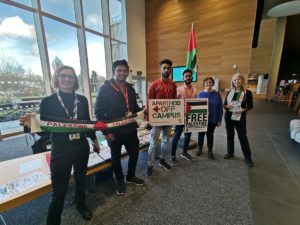 Students at Northampton University have linked up with their local Palestine Solidarity Campaign branch to run a stall on campus! 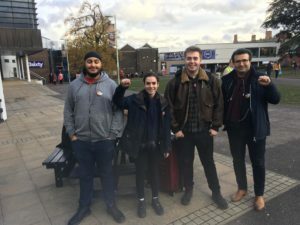 Our Twitter storm has begun! 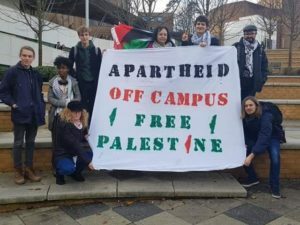 Show your support for the thousands of students taking action against universities’ complicity in Israeli apartheid by tweeting using #ApartheidOffCampus and #DivestForPalestine – tweet sheet here! 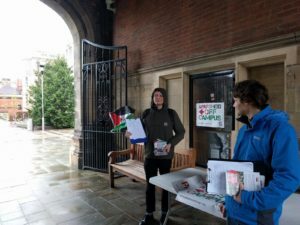 Newcastle students brave the wind and rain to launch their campaign to demand that the university cuts its ties with Rolls Royce, a company which supplies arms to Israel’s military. 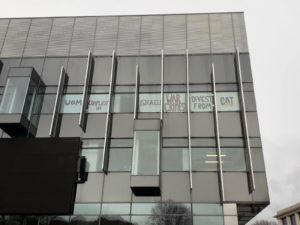 Manchester students have just put these amazing banners up in the iconic Alan Gilbert building right in the centre of campus, calling on their university to end its investments in Caterpillar! 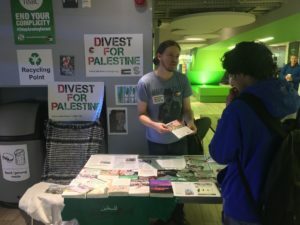 This company supplies the armoured bulldozers for the Israeli army to demolish Palestinian homes, schools, olive groves and communities. 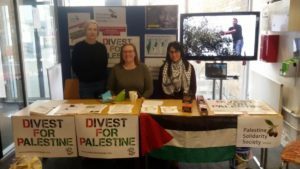 Canterbury Christ Church students are now holding a stall on campus to raise awareness and get support for their Boycott, Divestment and Sanctions (BDS) campaign. 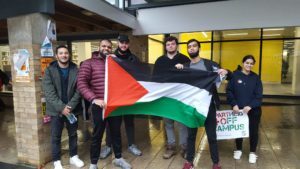 Leicester University students kick off the day of action with banner drops and a stall featuring their newly launched petition to demand that their university ends all financial and institutional links to Israeli apartheid.